there are now several indexes pages, one per day (as many necessary to reach the article limit, set to 950) using plugin dated-output. I won’t re-describe the whole setup, the relevant files to set up this new rawdog layout are here. On my webserver, it goes in /home/rawdog, using the user rawdog (group www-data). Obviously crontab is actually /etc/cron.d/rawdog and should be edited to refer to proper local users. RSS feeds are probably one of the most useful tools of nowaday’s internet. Obviously, it is not really complicated to find interesting pages over the web. It is way harder to keep up to date, however. These feeds fix that issue. I will not explain what RSS feeds are but will focus on how I use them. 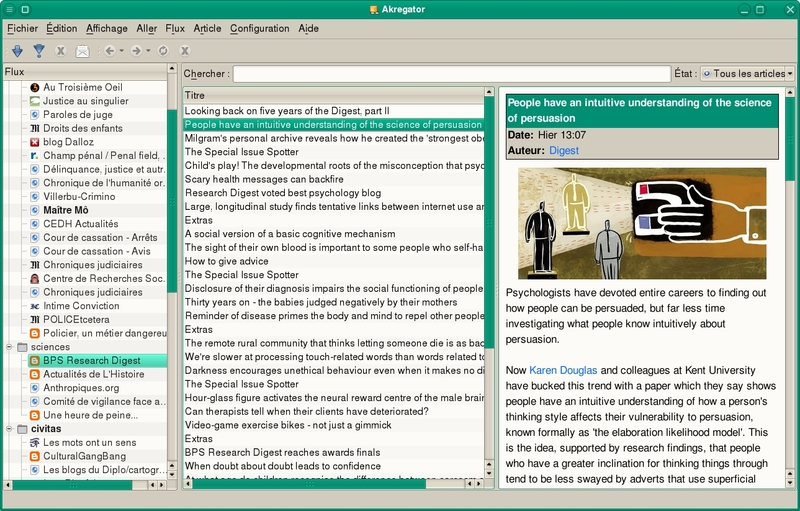 On my main workstation, with KDE, I use Akregator that aggregates all the feeds. It is nicely integrated in the enviroment: in Konqueror, with one click, I can add whatever RSS field is mentionned in the headers of a HTML page. After adding RSS fields, I can sort them by categories I defined. It happens from time to time that I want to access my RSS fields on another computer over the network or even with my laptop over the web. 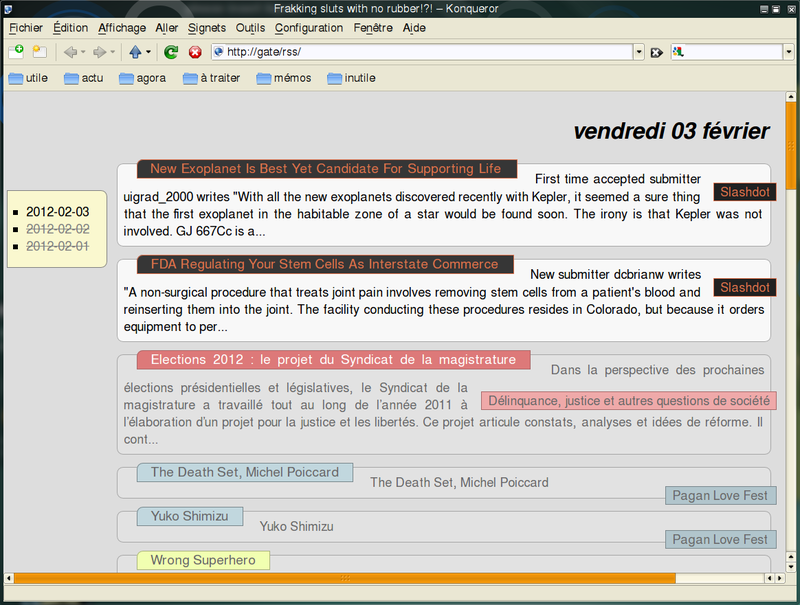 Here comes rawdog, a “RSS Aggregator Without Delusions Of Grandeur”. I picked it because it is easy to set up and lightweight (unlike TinyRSS etc). This aggregator is installed on my local network server and uses akregator list of feeds and produce a multicolumn HTML output that apache serves. First, on my main workstation (on which one I use Akregator): I set up a cronjob that copies Akgregator’s feeds list to my user account on the server. Note that I use SSH with a key with no passphrase to do so. Next, on server side, on which one rawdog has been installed (nothing specific here, it is shipped by Debian), I created a rawdog user account then made a symlink from /home/rawdog to /var/www/rss. We need first to provides rawdog with the Akregator’s OPML – it does not support it. To do this, I fetched a perl scripted made by Tero Karvinen that I edited so it support categories. It results in the following opml_to_rawdog.pl stored in /home/rawdog/scripts (/var/www/rawdog/scripts directory access over http being forbidden by Apache). It relies on two templates pages stored in templates/ directory: templates/page and templates/item. Not surprisingly, the layout is based on a CSS file called style.css – you will have to edit it to match categories names. It also requires the truncate plugin, to be stored in the plugins directory. That’s all folks (even if there is room for improvement)!